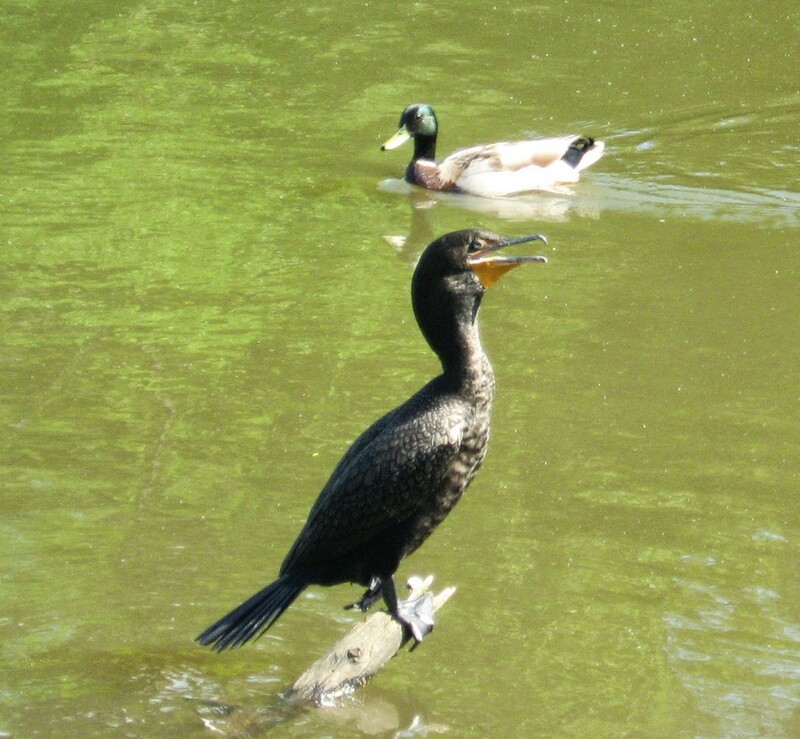 Many kinds of wildlife inhabit Lake Lynn, but (for enthusiasts) it has a citywide reputation for its turtles. 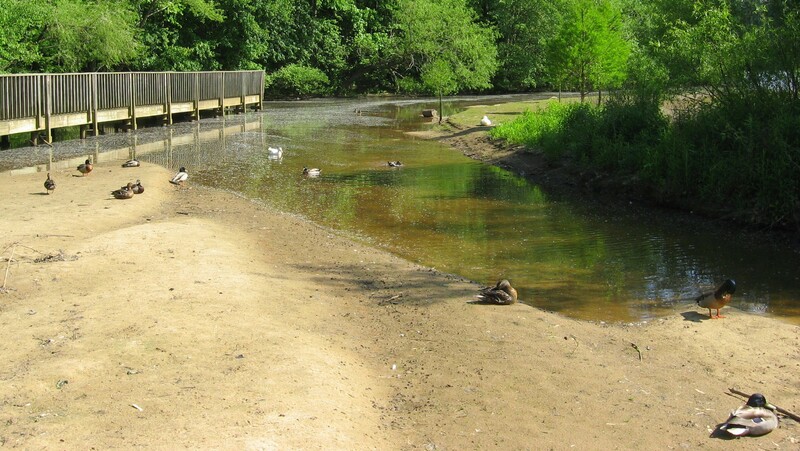 Lake Lynn, along with Shelley Lake, was created to provide flood protection to Crabtree Valley Mall, which was constructed in a former muddy cow pasture and flooded soon after it was built. 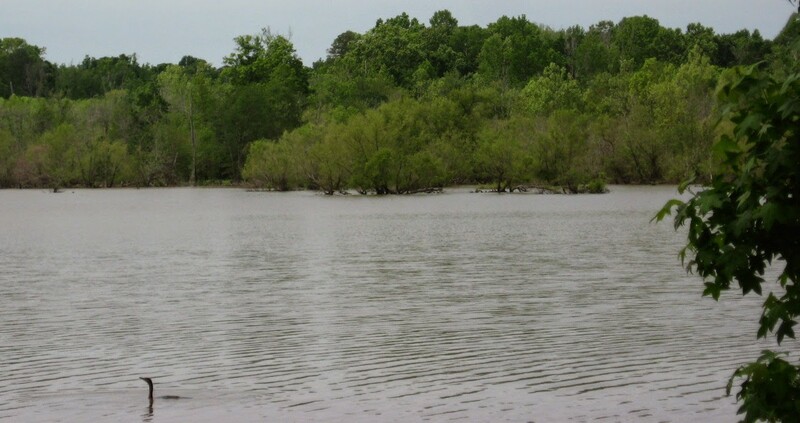 Hare Snipe Creek, which feeds Lake Lynn, runs from the back of Tabernacle Church on Leesville nearly due south all the way to Crabtree by the Golden Corral headquarters on Glenwood Avenue. 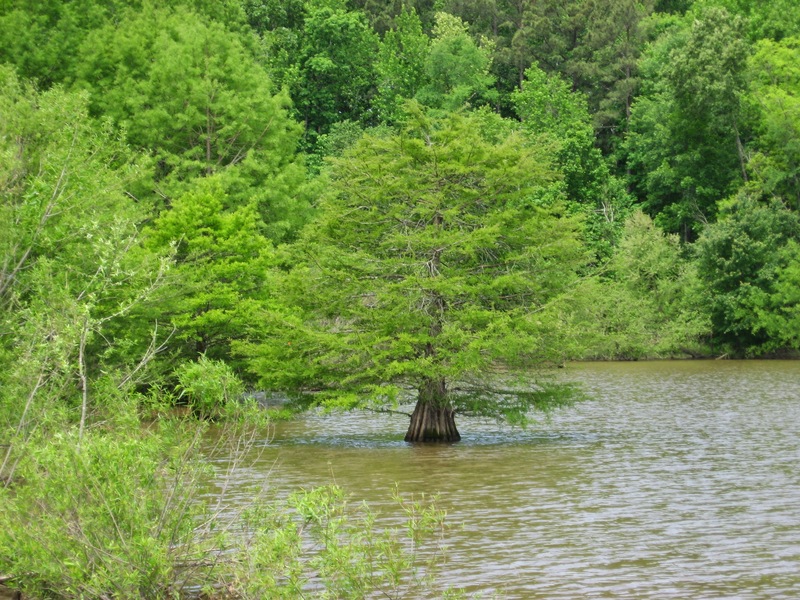 Lake Lynn has a gigantic earthen dam but is normally quite shallow, and its edges are dissected by the numerous small creeks and freshets that formerly found their way to Hare Snipe Creek. 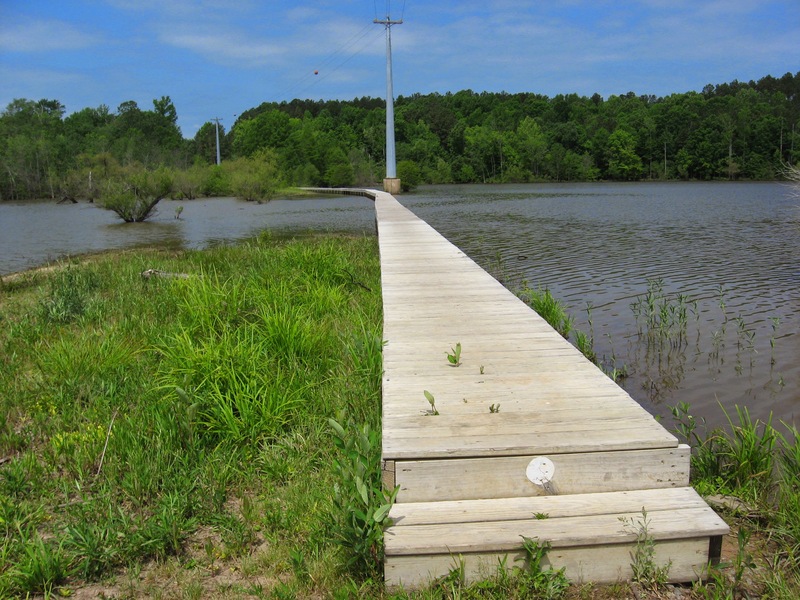 A popular greenway with long boardwalks encircles the Lake, and a spur follows the soggy wetlands of its headwaters up to a public park. At uncrowded times (and I’m talking people driving and parking at my apartment complex just to walk here) it’s an opportunity for some remarkable encounters with nature. Some of the more interesting birds to watch are naturalized escapees – dark, red-wattled Muscovy ducks and aggressive white barnyard geese. Lake Lynn itself is a mixture of native and natural features blended with the man-made lake and the surrounding (relatively wooded) apartments and houses. The Canada geese, well described in an earlier post, are so numerous and boisterous as to evoke aquatic chickens as they honk out the rising day outside our windows each morning. Just a few miles north of Lake Lynn I can cross over the highest spot in Wake County – Crestmont off Leesville Road – and travel out of Crabtree Creek’s watershed into that of the Neuse, inundated by Falls Lake. North of 98, off Baptist Road, is an access point for the Mountain-to-Sea Trail, which traces the southern shore of Fall Lake. Here a juncture of powerline cuts and shallow lobes of the lake provide wide open views and a nifty look at a population of cypress. 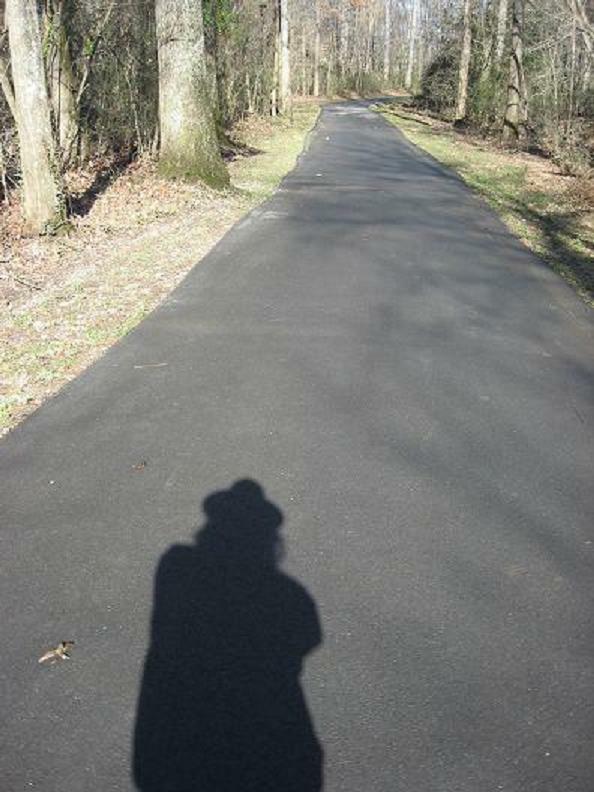 There is a stunning serpentine boardwalk that serves the trail, and a raised bridge over Lick Creek with gorgeous views. More to come, as well as more on the whole stretch from here to the Rollingview Marina. Nice. I haven’t visited that trail since it opened. I’m going to have to get to that boardwalk over Lick Creek. Thanks for sharing!